For American males of my generation-a lot of us anyway-when we hear the word “Vietnam” what we think of first is the war that took place in that country, rather than the country itself. The geographical names we learned were those connected with events: the “Gulf of Tonkin incident”, “the mining of Haiphong Harbor”, “the My Lai Massacre”…. The war years were formative for me, and to a large degree, American culture. Fault lines cracked open between old and young, those who went to war and those who didn’t, the establishment and rebels, between what we now easily identify as conservatives and liberals. At the time it seemed like everyone was either for the war or against it. I was against it, even in my early teens. I was the 16-year-old farm boy wearing the “Peace Now” button, while a lot of my neighbours had “America-Love it or Leave it” bumper stickers on their pickup trucks. I didn’t fight in Vietnam–I fought to stay out of a war I didn’t believe in. But the war was a part of my life, nonetheless. For years footage from the front lines was featured on the nightly news hour (before cable news, remember.) It was something many American families consumed with their dinner. Eventually anti-war protests across the US, and around the world, were also covered. For myself, and a lot of other Americans I’m sure, Vietnam, the war, has remained a partially unhealed wound, like a bone that broke badly and mended poorly. This trip to Vietnam, the country, was an exorcism of sorts. It was an opportunity to overwrite what was essentially a symbol for me with impressions of a real place, with real people. Today there is remarkably little evidence of the war in Vietnam, either physically, or in the attitudes of the people. The physical scars have mostly been erased–intentionally or by time–and people seem much more intent on looking forward rather than back. One man we spoke with, who was 12 years old when the war ended and had seen people blown open said, “Back then, us and the Americans were enemies. Now we are friends,” and made a gesture indicating not just friends, but close friends. 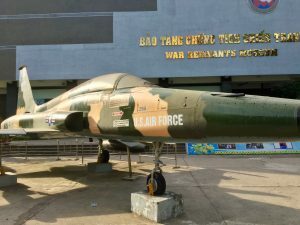 American fighter jet displayed at the War Remnants Museum in Saigon. However a visit to Saigon’s War Remnants Museum is a sobering reminder that even if they may forgive, those who lived through the war can never forget. Neither can the second- and third-generation victims of the defoliant, Agent Orange, who live with birth defects, or those who, to this day, stumble across unexploded bombs dropped during the war. It is reassuring to see that communist Vietnam is doing reasonably well and that its people are warm and welcoming to everyone, even Americans. It has its problems, similar to most countries in this region, but if this is what 60,000 American soldiers died fighting to prevent (along with probably 20 times more Vietnamese on both sides), it was a tragic waste of life indeed. I think the effects of losing the war in Vietnam are still being felt in the US; there are those who remember the sting of defeat. A lot of people want to “make America great again” and get back to a time when we were “winners.” They want a do-over, if not in Vietnam, then some other foreign country. And if they can find some foreigners closer to home to kick around, that will do in the meantime. I wonder how many of those people have ever traveled to another country. I’m not saying you come back feeling warm and fuzzy about everyone you meet (I have a short list of tourists from certain countries I’d rather not be around) but something you learn is people everywhere are pretty decent, trying to get by like everyone else. Thanks for the update and your comments about your experiences in visiting Vietnam….. As you may recall, we were born in the same week in December, 1952….. So I grew up at the same time and had to come to grips with the Vietnam War also…. For me, of course, it was as a Canadian, but I remember discussing the war with my friends back then and how if we had been born only a couple of hundred miles further South, we would likely be living the war experience in a much different way…. When I travelled in Vietnam in 2002, I observed the same attitude with the local people….. a desire to live in the present and think about the future….. Not much focus on the past. I came away thinking that that was probably a good way to live one’s life!!! Quite the opposite Denis, you are high on my list of people I’d like to run into again on my travels. Hope it works out someday.